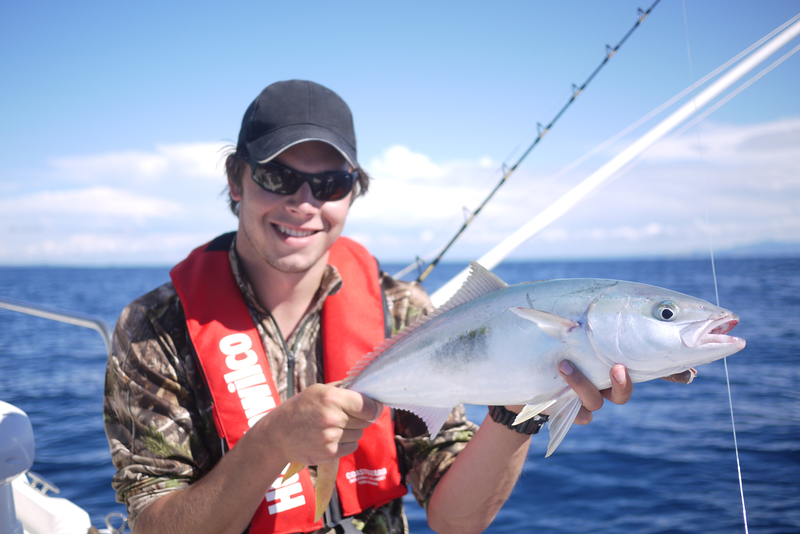 Lucas Allen – Upper North Island Summer? Well well, another year down huh. 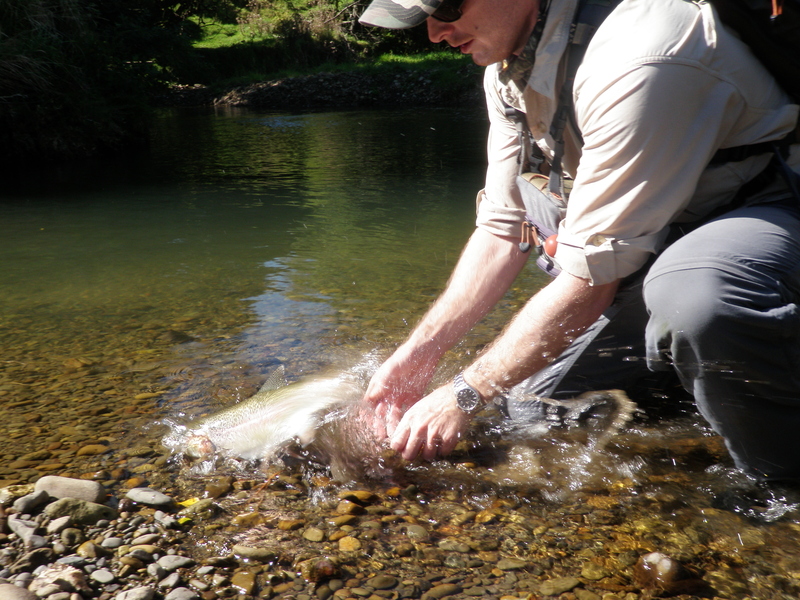 I must admit that my fly fishing has been a little on the back burner over the last 2 weeks. This I am well aware of and have booked in for some serious trouting in the coming week. Come Wednesday I’ll be based in Taupo for a few days and with any luck there’ll be some good adventures to be had. In the meantime I’ve included some of my recent holiday exploits (some fresh water, some salt). 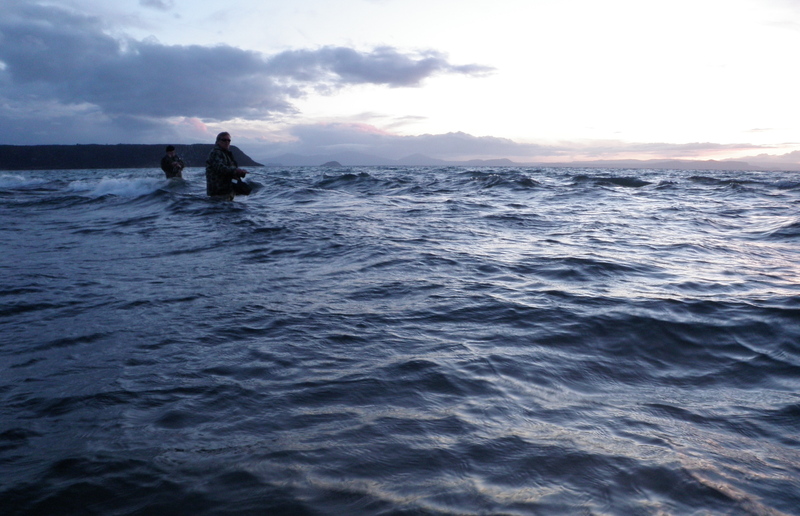 It all began with an epic harling and jigging trip on Xmas eve with Dad in Lake Taupo. 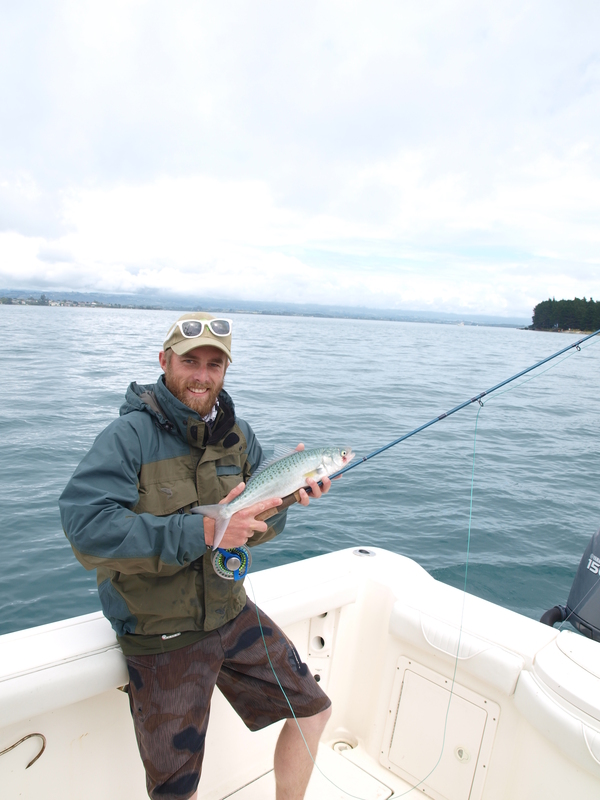 We boated around 20 fish in short order, most of which were in great shape and had brilliant orange flesh. I know some of you guys may think it’s cheating but when it’s your first day off and the lake is dead flat the purist in me takes a back seat. My next major milestone was dropping the engagement bomb on Christmas day (she said yes!). 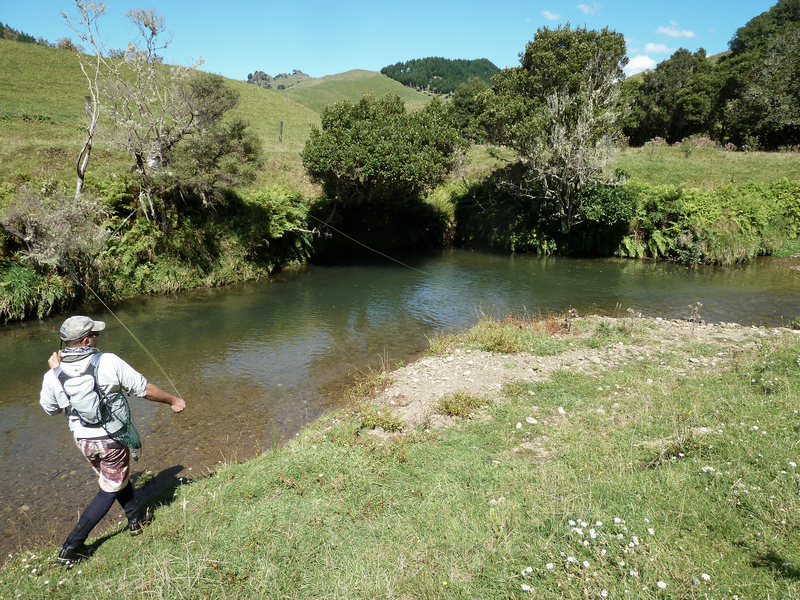 So the next day we went wandering up one of my favourite little streams in Hawkes Bay. I knew it would be a little prickly getting in but wasn’t prepared to endure an ear bashing after coming to a wall of blackberry that was near on impenetrable. We beat a retreat and raced back down the road to plan B. This river is also a favourite and it had been a few years since my last visit, from memory it fishes best when you’re up early and not compteting with the spinners! 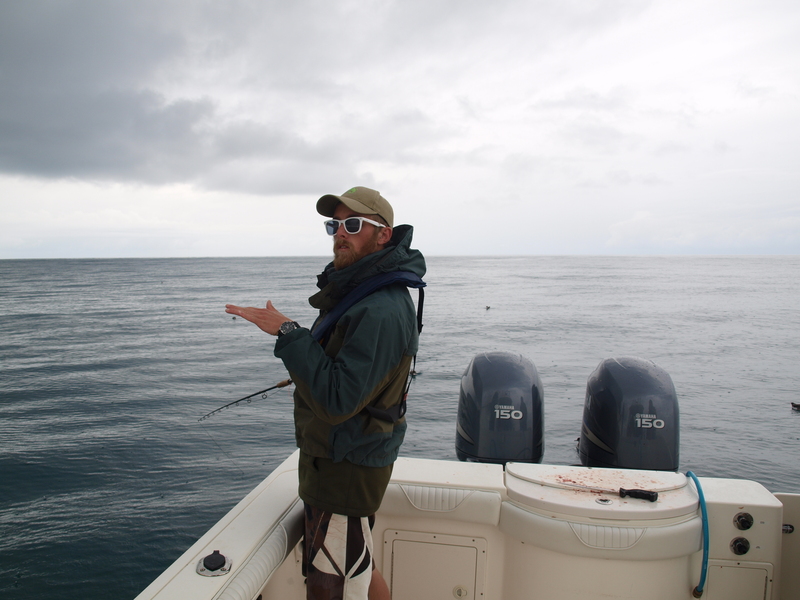 Needless to say all the fish were rather flighty and I didn’t fare to well. It was a nice day though and good to see the old stomping ground. Over New Years a group of us booked out Leigh Fishing Lodge, bloody awesome spot and some of the best hosts I’ve encountered. Although it started raining the day we arrived Keith and Lynn were exceptional at making everything hassle free. I’d recommend them to anyone heading up those ways. Thankfully we made do with the conditions even if one of the nights rainfall was the heaviest they’d encountered in many years. The marine reserve at Goat Island is even better than I remember and a great example of marine conservation up close and personal. After returning from Leigh we set upon the start of our new landscaping project, soon enough I got sick of the shovel and we shot up to Tapu where Tina’s Dad was staying. The weather was still topsy turvy so we bowled out early on Saturday ahead of the approaching storm that ripped the stern off the Rena. 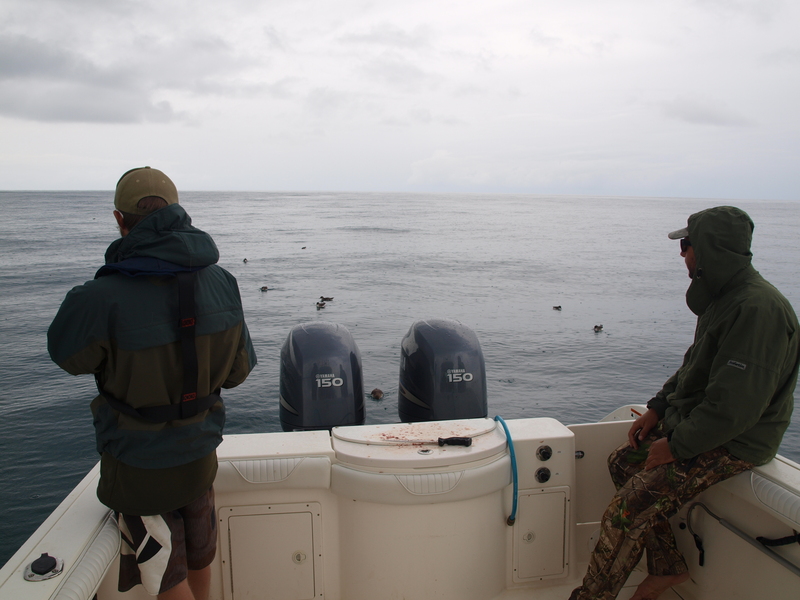 We nailed some good Snapper while hovering near the working mussel barges and got thrown around the boat a fair bit, not to mention the rain… oh yeah, it rained, what a surprise! I also discovered there is such a thing as too much burley. 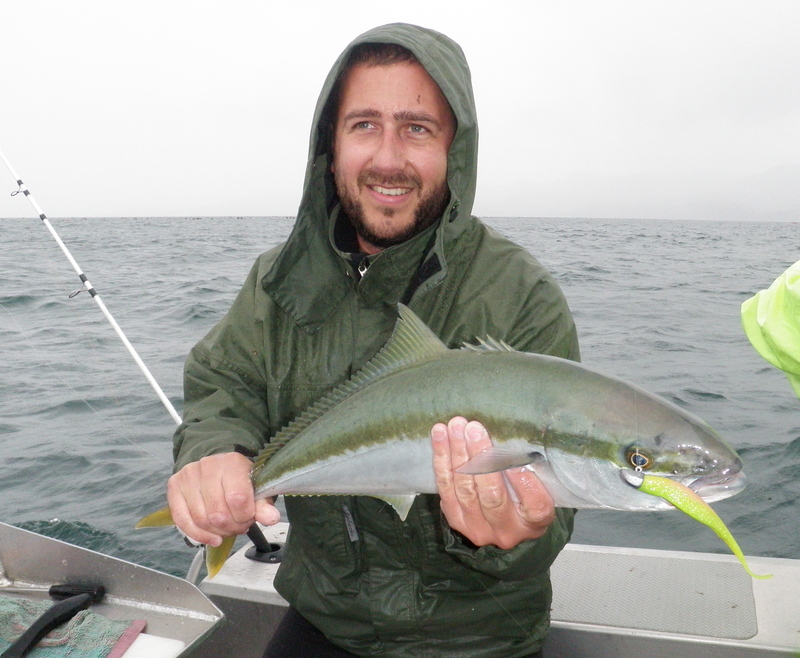 While scraping with a Rat Kingi in the discharge mess I got so much crap on my braid it jammed in the top eye of my softbait rod. It was no wonder the telltale needed clearing once we started motoring back. It would be fair to say this is the closest I’ve come to shooting fish in a barrel. Hard fighting Ratty, yep i got soaked through. That is just a quick summary of the Summer so far and with the weather on the improve I’m amping to go hit the Rivers. Come Wednesday the flyrod will be the main priority, of course after I’ve finished stage 2 of the landscaping! I hope you’re all having a good break and squeezing in as much fishing as possible. Keep safe. While I’m still madly busy with the end of year duties I haven’t neglected the fishing and have managed to get out a few times. 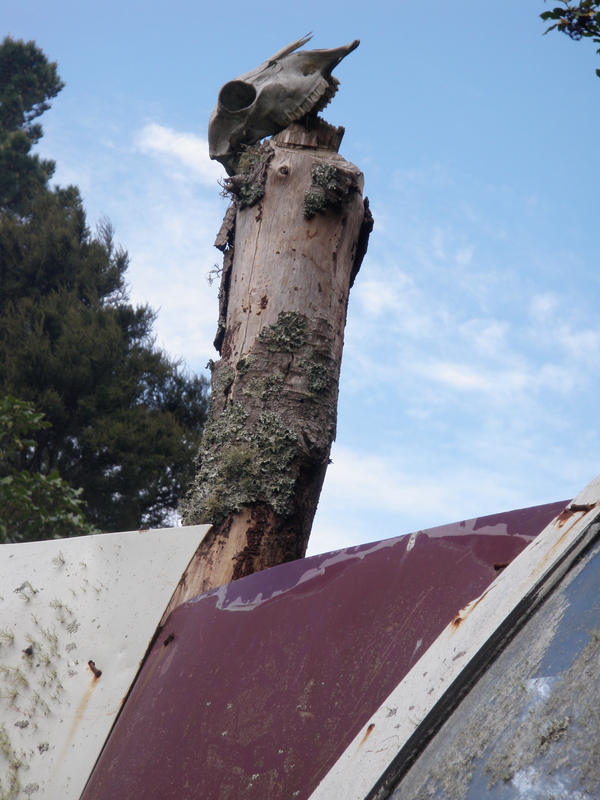 Even though the weather this weekend meant we only looked at the Whakatane bar, gutted! The trip I had sussed with the old man went ahead on a rainy Sunday earlier in the month. 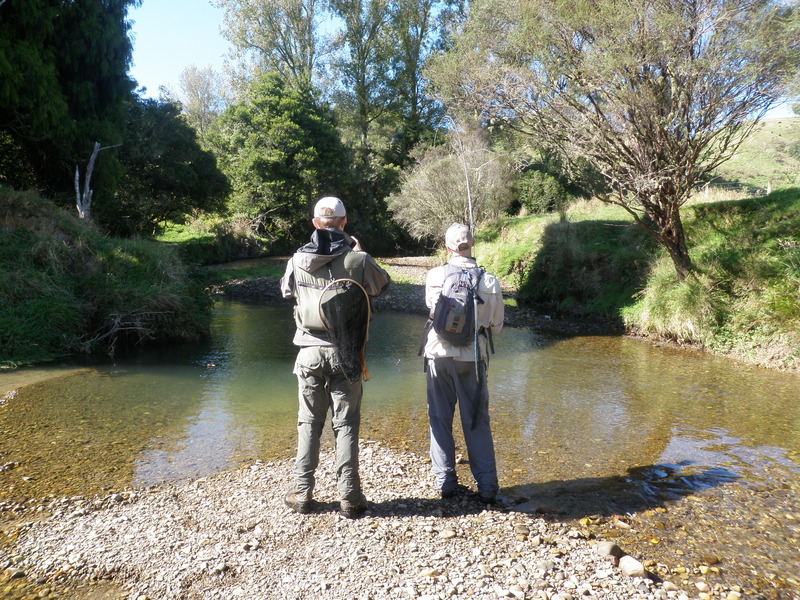 We picked the newly opened reaches of the Ngongotaha river to fish. I arrived around 7am after a quick drive from Hamilton and was greeted by Morri who was just getting sorted after his drive North from Taupo. We were surprised the park was empty and wasted no time getting to the water. Upon approaching the first pool we stopped and looked into the water. 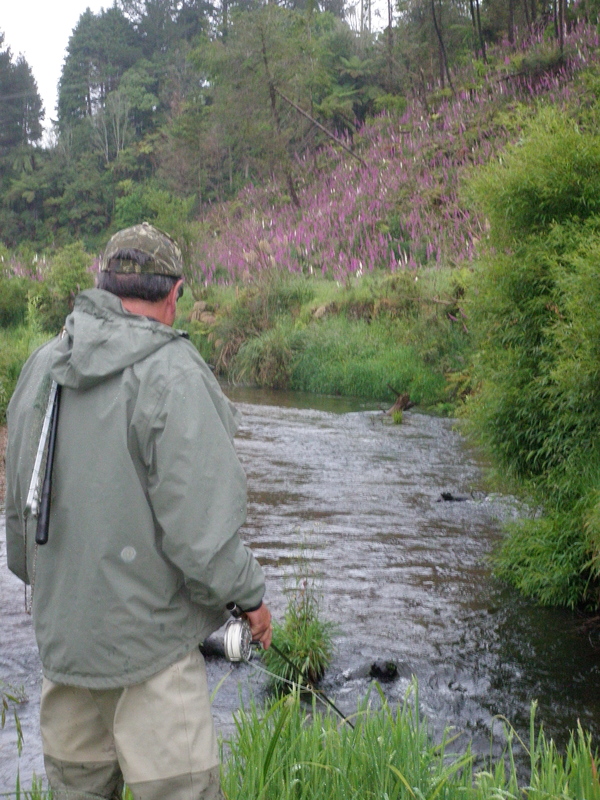 The spot I normally see a few fish sitting in was empty so we crossed the river to start searching the first runs. Just as I was mentioning to Dad to be alert for big browns in the edges we noticed a rather large tail stir up the water and vanish deeper into the safety of the bank/snag. It wasn’t long before we saw a fish feeding in the run and threw a couple of drifts over it until it caught wind and did the old Houdini. It was still raining and my glasses were fogging up something chronic. While I sorted them out Dad had another flick at a fish sitting in the shallows of a bend, occasionally moving back and forth chewing on nymphs. 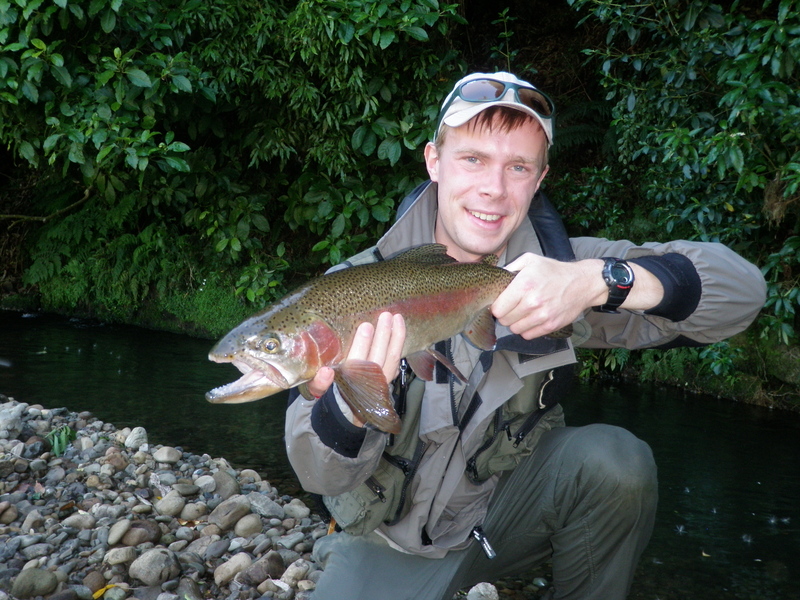 Whammo, the recovering Rainbow smashed the fly and took off straight up to a big log. After giving the fish some slack it swam back up and off the log much to our delight, some more risky runs and it was near the bank for netting. I jumped down the bank and into the water, putting the net under our first conquest for the day. The smile on Dads face as he helped me back up the small cliff said it all. That was to be the theme for the rest of the day. 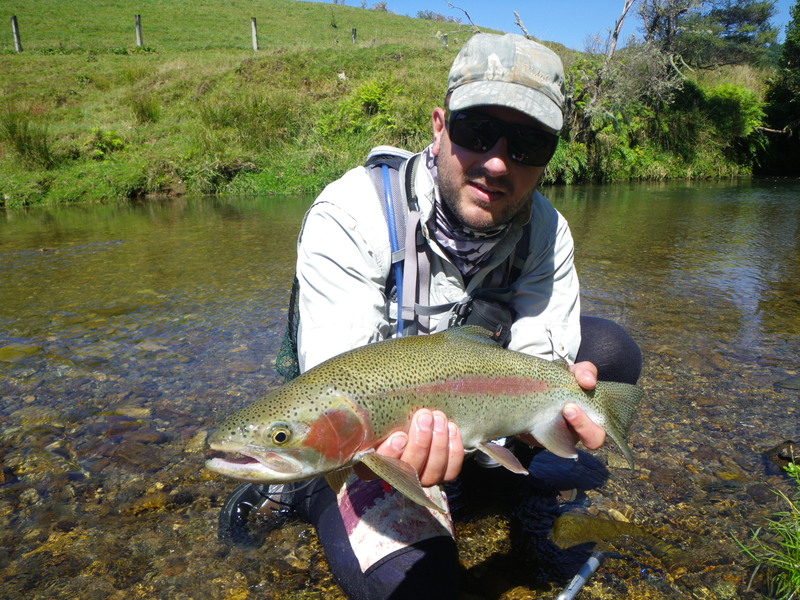 We each landed a mix of nice fresh run rainbows to 4lb and some recovering darker jacks that inhaled flies with no hesitation. The big brown wasn’t the only one we saw, we counted at least 6 lurking around in log jams, under bank edges and vegetation. 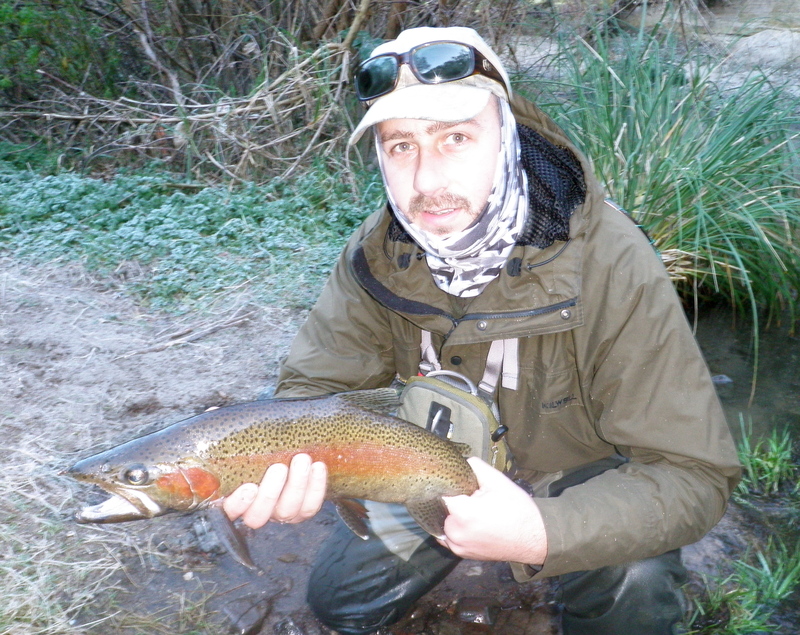 One of them even stuck around to let me bounce a massive black streamer right on its nose. It was incredibly dominant and kept its mouth shut while it was pestered. The river also had a lot of fish that appeared to still be spawning that were very spooky and not that interested in eating. 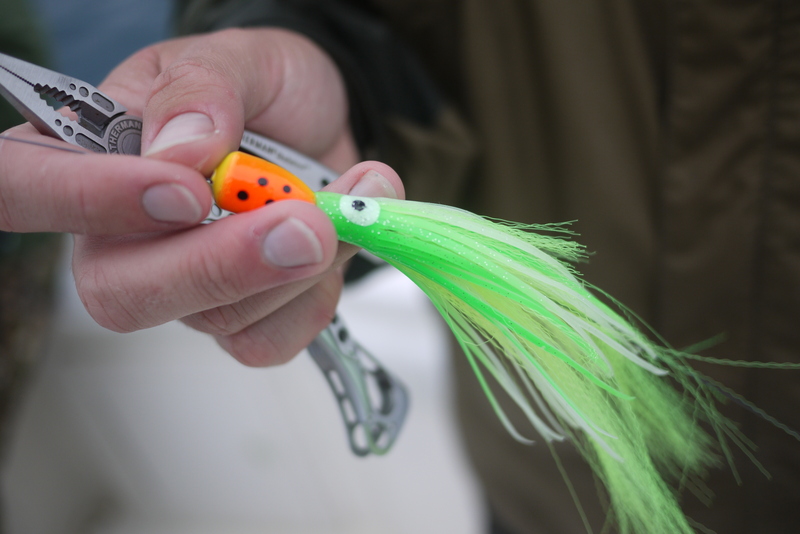 The pick of rigs was the dry/dropper as it is super subtle on the spooky fish and also keeps the dropper out of the snags which abound the river. 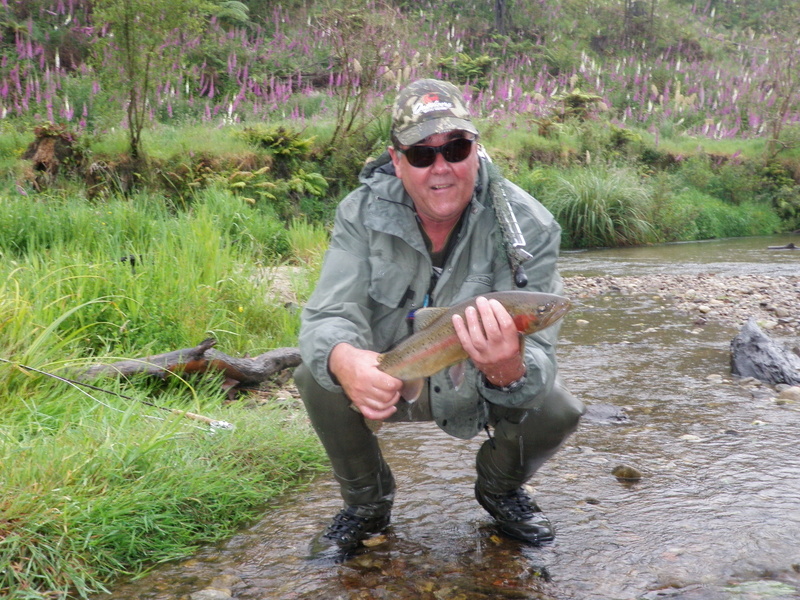 This is part of the reason I love fishing the Ngongotaha, it’s a pokey, fun wee river with a reputation for large fish. 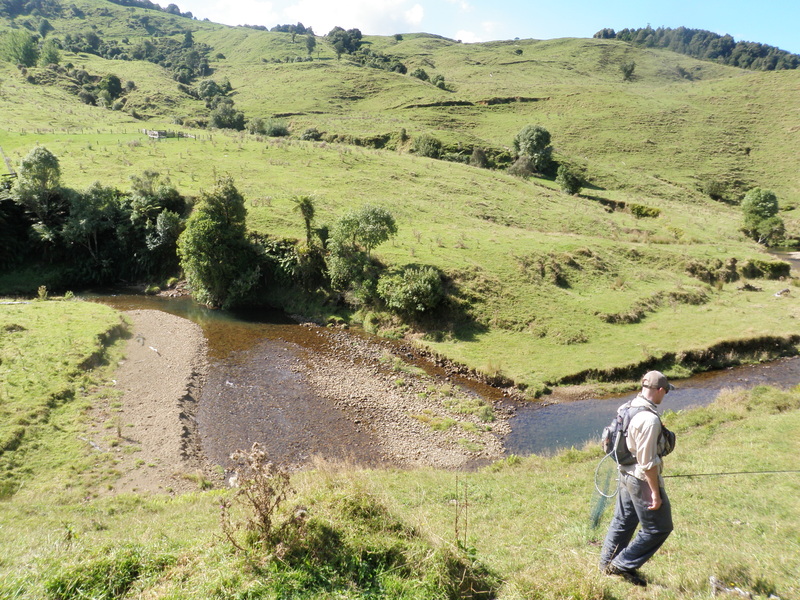 We also did a quick recce around the lower reaches of a few nearby rivers, spotting some hefty fish that were very reluctant to take our offerings. One fish in particular is the reason I’m going back for a night fish hopefully this week, it was much larger than the ones seen earlier in the day! 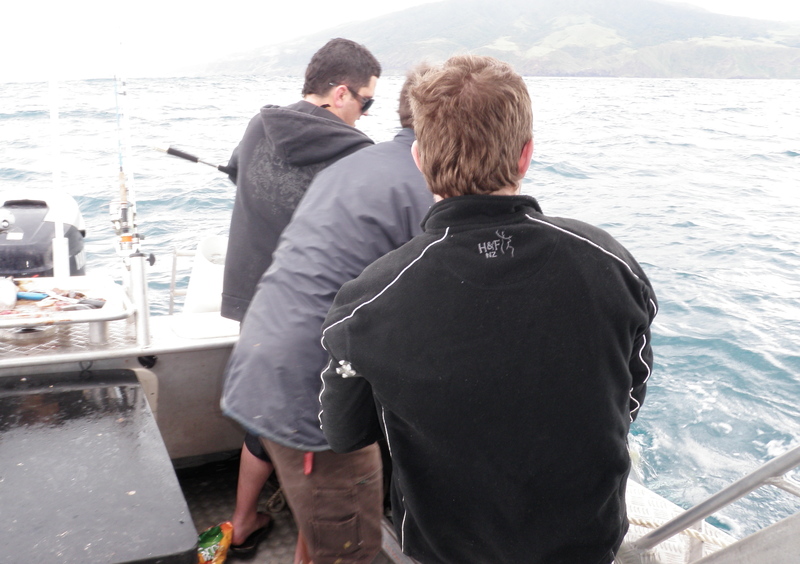 The following weekend some mates and I had a charter booked for Raglan. It was to be my first trip over the notorious bar and into the wild west. 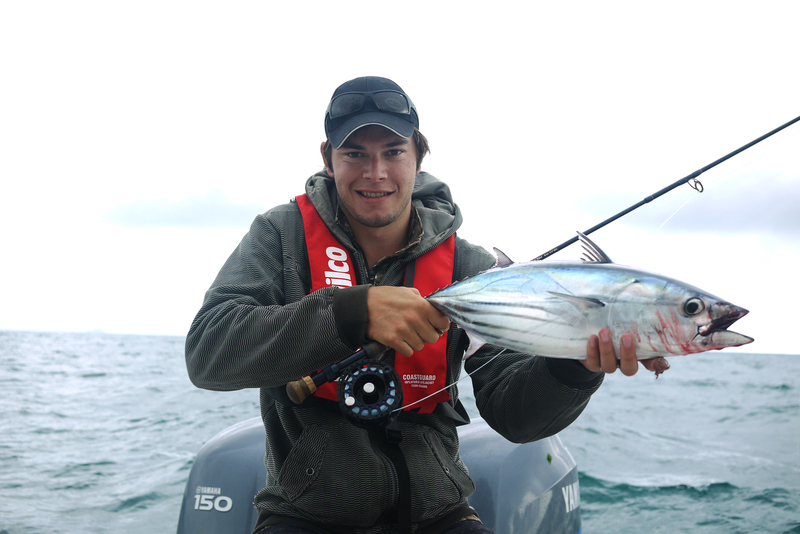 This day the bar was very docile and Shanan soon had Game On racing out to Gannet Rock, once there we hit the sign with an array of jigs and after a few fishless drops we settled into the idea of a snapper fish closer in. 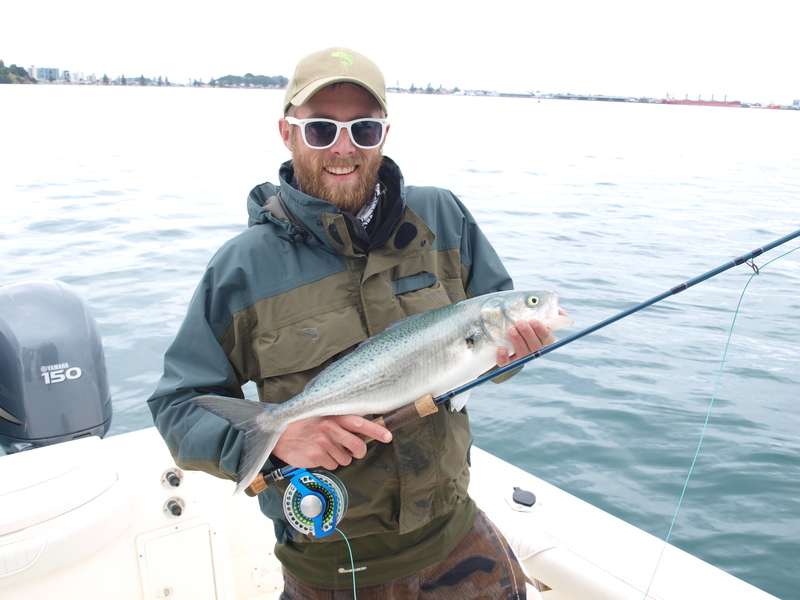 Once anchored up the fish began to slowly come on the chew. 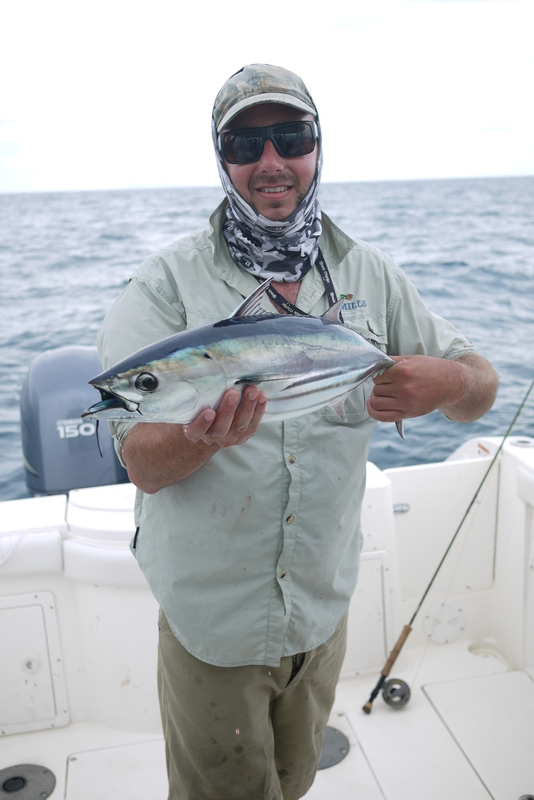 Our lucky angler Richard from Hunting and Fishing Waikato lead the charge with decent gurnard and a nice sized pannie lining the bottom of a freakishly big icebox. We kept up with our share, adding sharks and tangles much to Shanans delight, also taking a few kahawai, legal snapper and gurnard. 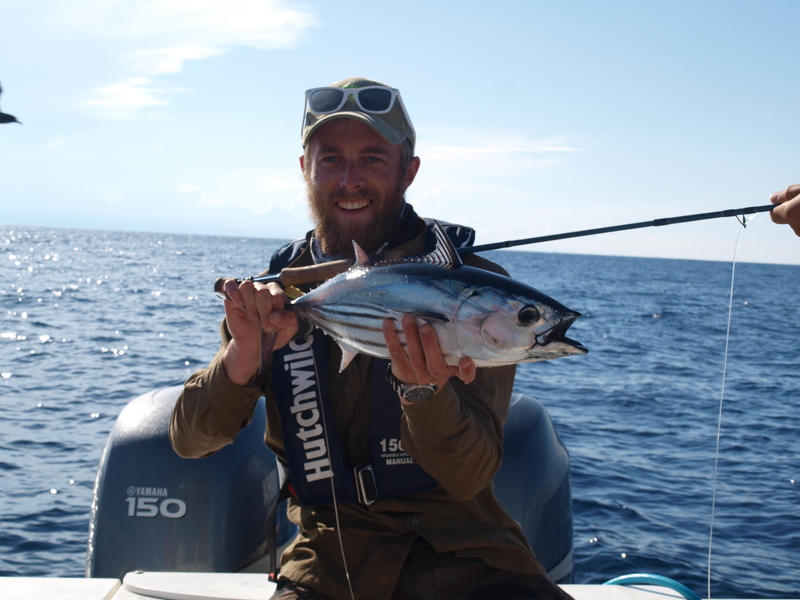 Skipper at work, amongst the triple hook up madness! After a while we lifted anchor, even managing some gear back off the rope. 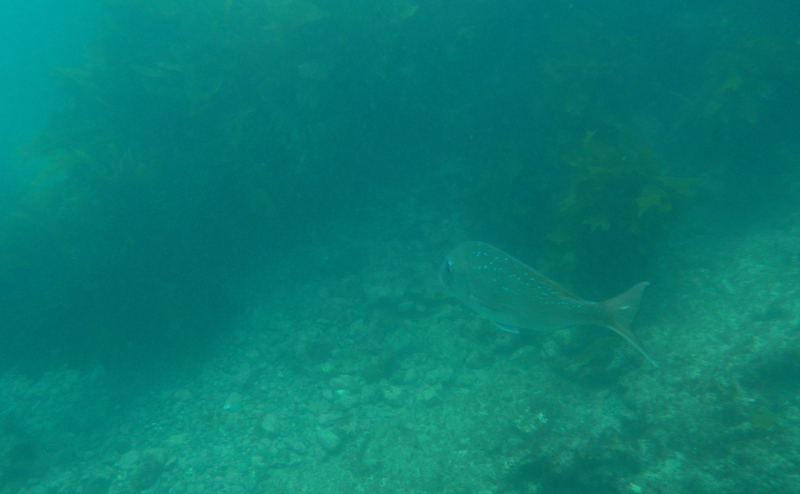 A quick squirt to a nearby reef and scout around had us over some more kingi sign. The first drift was unsuccessful but the next one had us hooked up. And hooked up. And hooked up. It was calamity as I watched our mate Riki take his first ever king flanked by 2 pros doing battle. My only words of advice to him were to hold on to my rod, I was glad he listened because later on he got absolutely dusted on 80lb braid. 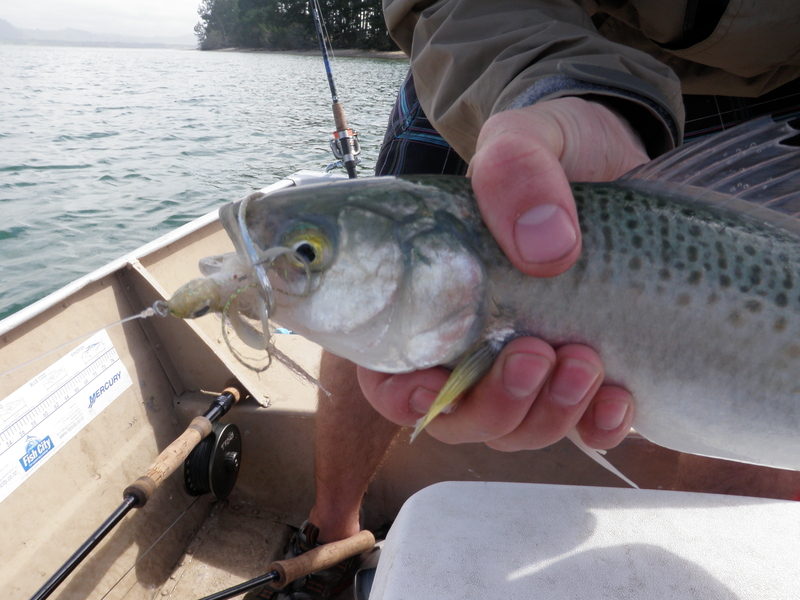 We each boated a few kingis in the quick fire session. My new early (thanks Tina) Christmas present was still too shiny so I put a 5inch grub tail on and flicked it away from the jiggers. A couple of knocks later and I came up solid, the fish racing off as line peeled from the spool. I vaguely remember Richard pre-selling me some more braid as a joke. 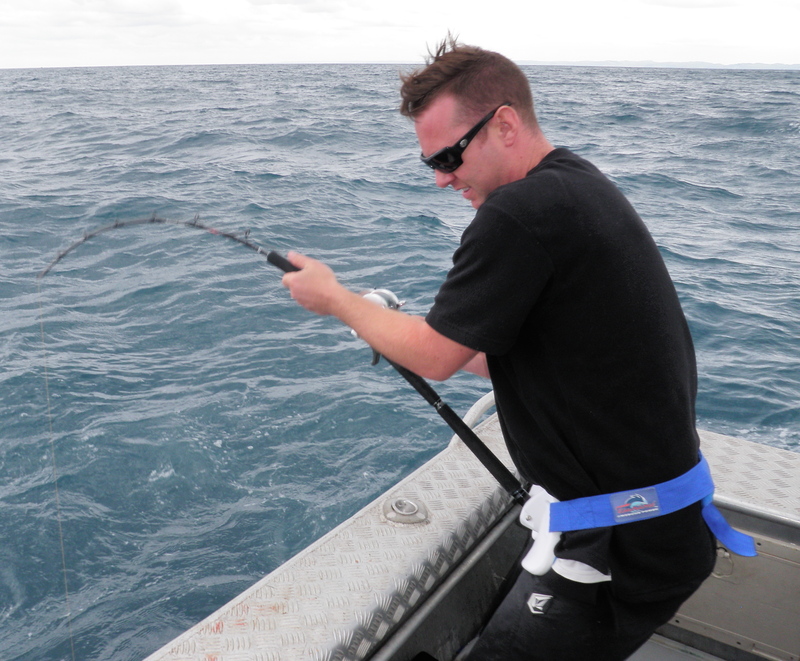 Just as I thought things were starting to go my way we drifted past a cray rope, the fish going straight around it. I watched the float go under and pop back up as the line parted from the fish, thankfully not too much new braid was lost. 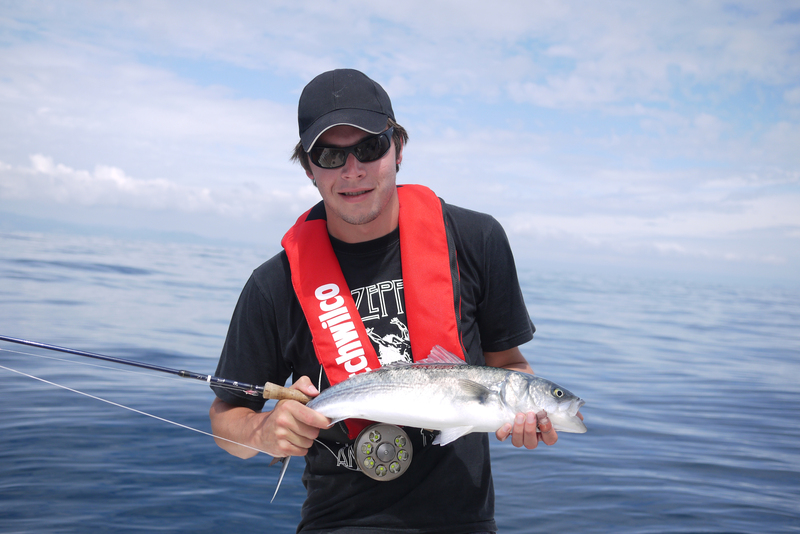 Next cast was met with the same response and shortly after I was locked in with a hard fighting trevally. This thing was determined to get away but the new kit was well worth the purchase. After what seemed like 10 minutes and already having sore arms we finally saw colour, much to my relief. 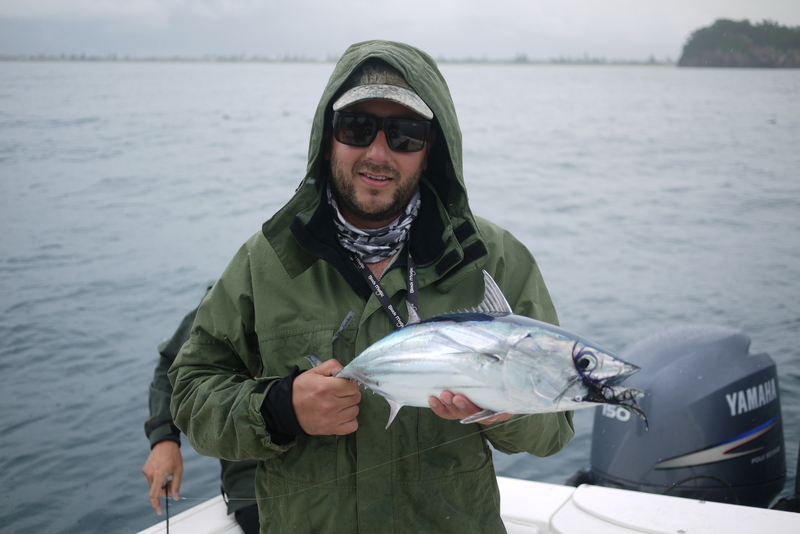 Some quick gaff work from Shanon and I had blooded my rod, stoked. Well that is all that’s worth reporting on for now. 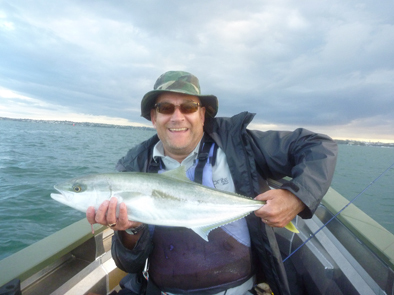 I have pretty much sorted my next month for fishing plans so am hoping for good weather, willing fish and in particular sight fishing for kings on the fly at Leigh (please Santa). Thanks for reading over the last year. Here’s wishing you all a Merry Christmas, keep safe out there and most of all have fun. 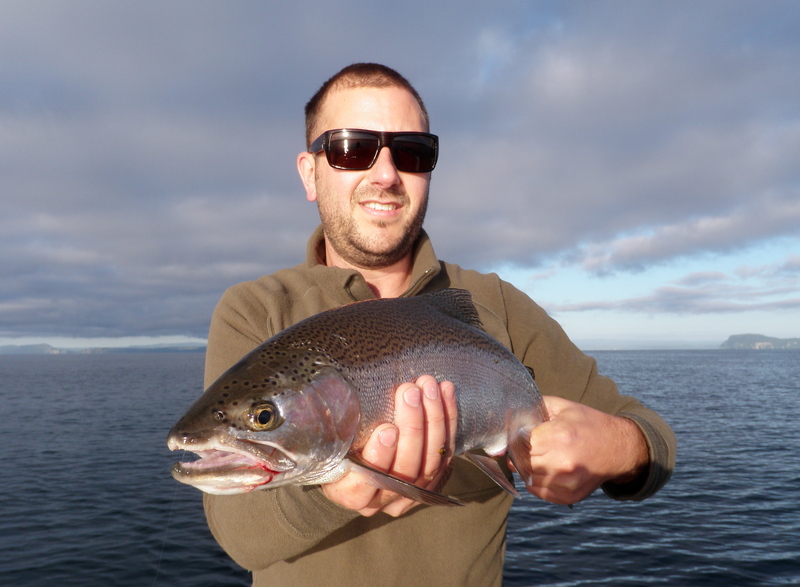 Over the weekend I shot down to Taupo to have yet another crack at the Trout population. 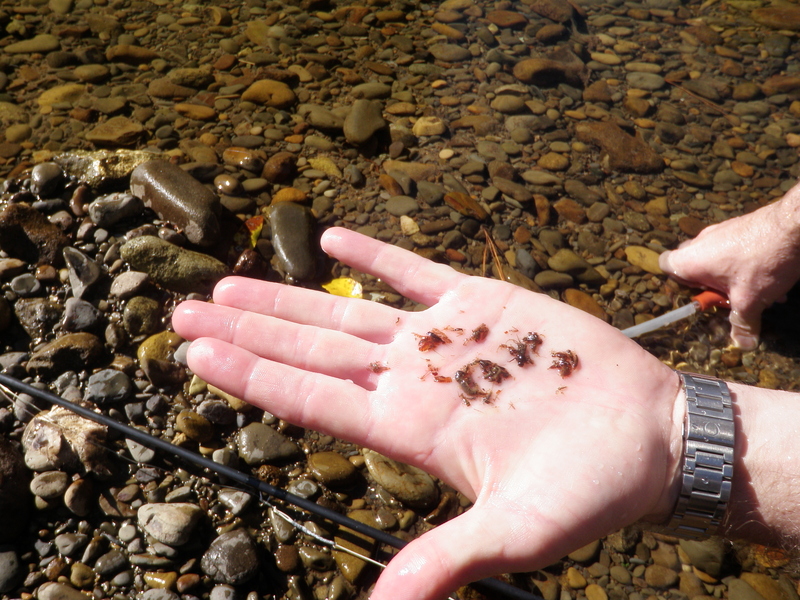 Unfortunately the rain forecast earlier in the week never came to much, the rivers remained relatively low and clear. I figured it was a good opportunity to iron out a few things and stretch the arms in the lead up to October 1. With this in mind I planned to fish a few rivers to keep things interesting. 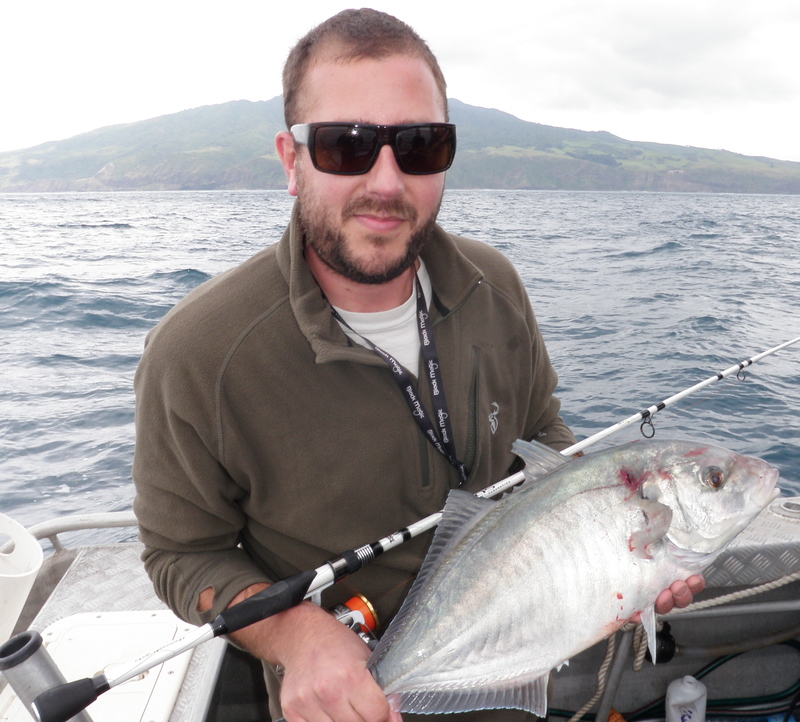 After consulting the Old Man, Taupo fishing reports and a mate it was obvious the Hinemaiaia was fishing well. The car was loaded up on Friday night and we sat down to watch the rugby with a few beers. Before the crack of dawn a knock on the door signalled the start of the day, so much for a sleep in! Dad and I scoffed down some breakfast and hit the road to the Hine. It pays to get in there early and we were rewarded with an empty car park. 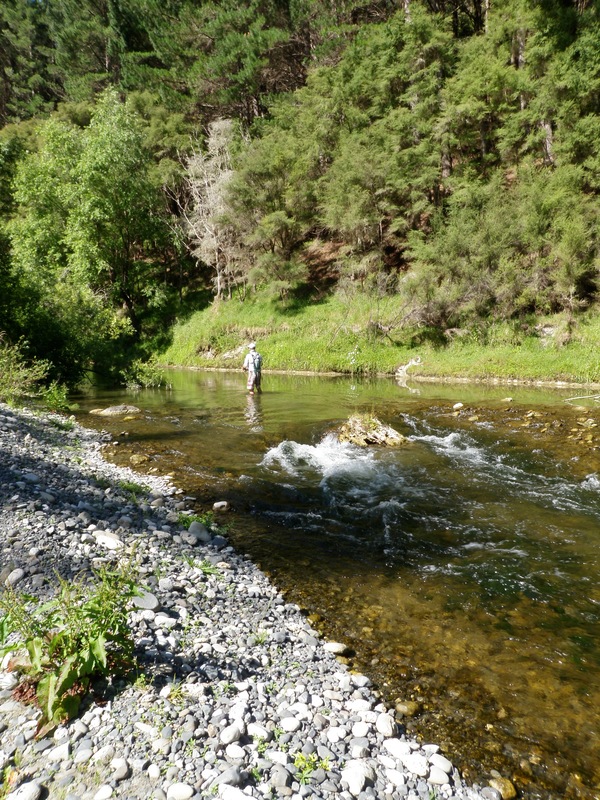 We dropped into the water where there have been numbers of trout in shallow before the masses drive them out to deeper holes and riffles. Sure enough they were there but casting to them is near on impossible so we pushed up river to a good looking run that also holds well. Shortly after and following hot on Dads heels I had my first victim. Well it thought differently anyhow and spat the dummy mid flight, a spirited little Bow that had lost a bit of condition since entering the river. Oh well, not to worry, there’ll be more. Bam, on again. This time the hook up lastest all of 2 seconds so I never really got to gauge it’s size. Finally after another hit I got one to stick. 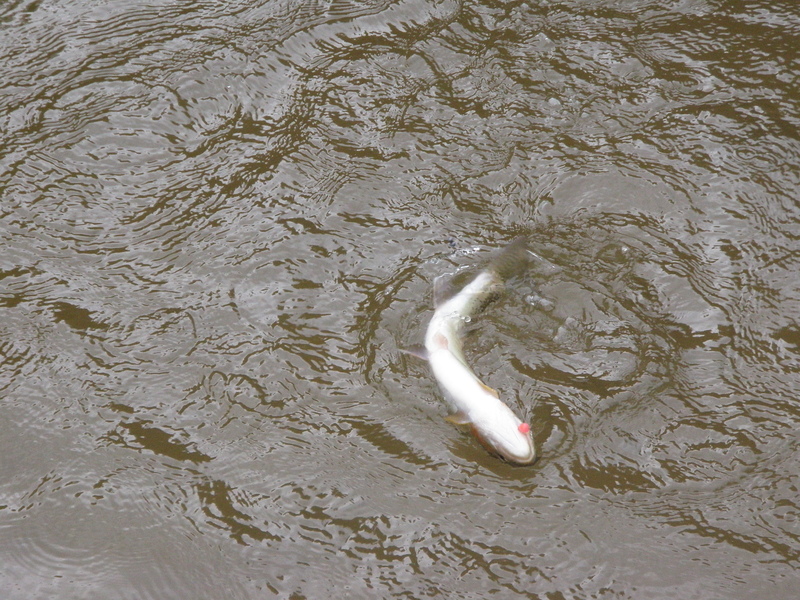 The trout took full advantage of the strong current and promptly took off in it. 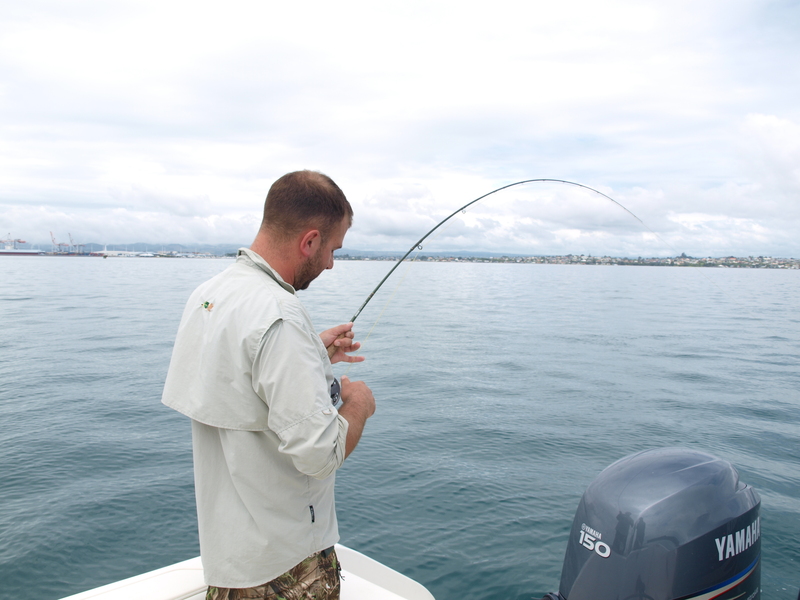 Once behind a rock and sitting comfortably in the back eddy I lay the rod over and pulled it into my waiting net. Out came the camera for a photo shoot when I noticed a massive wound that couldn’t be photoshopped. 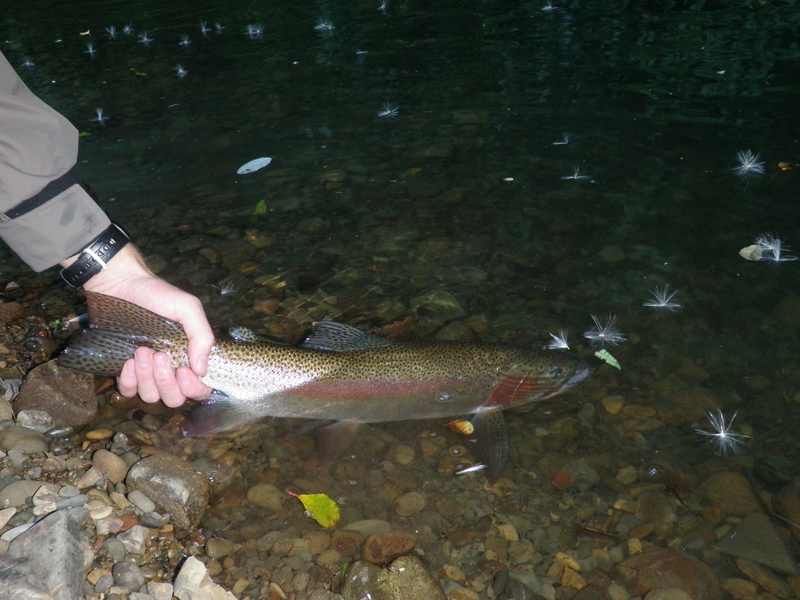 The pic below is a Trout caught two weeks prior in the same spot, same size but far more photo worthy. It was so cold that morning my reel froze solid! 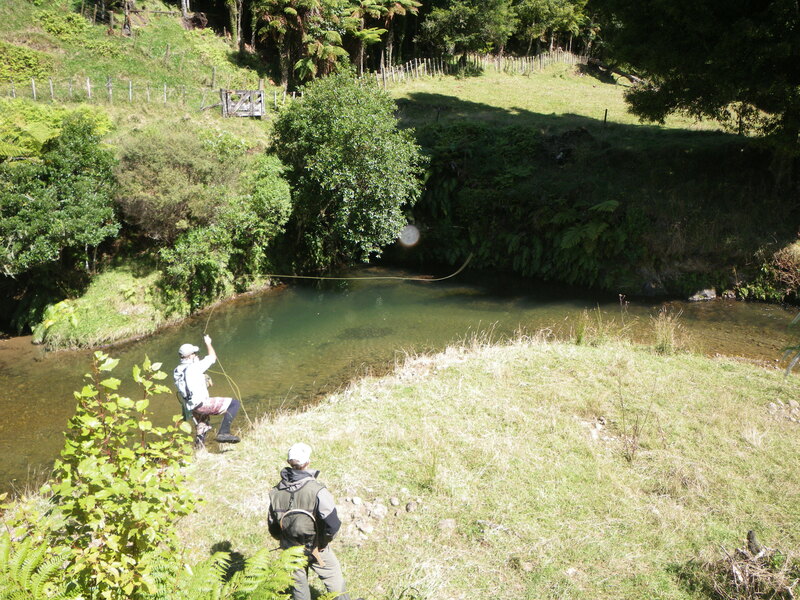 We worked in tandem up to the cliff pool picking up a few fish along the way. 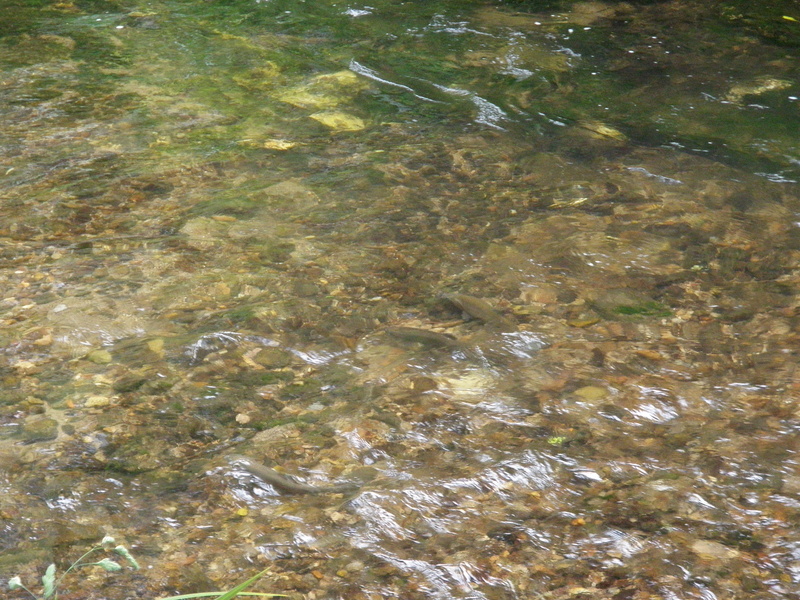 This river currently has a lot of active spawning redds and care should be taken not to disturb. 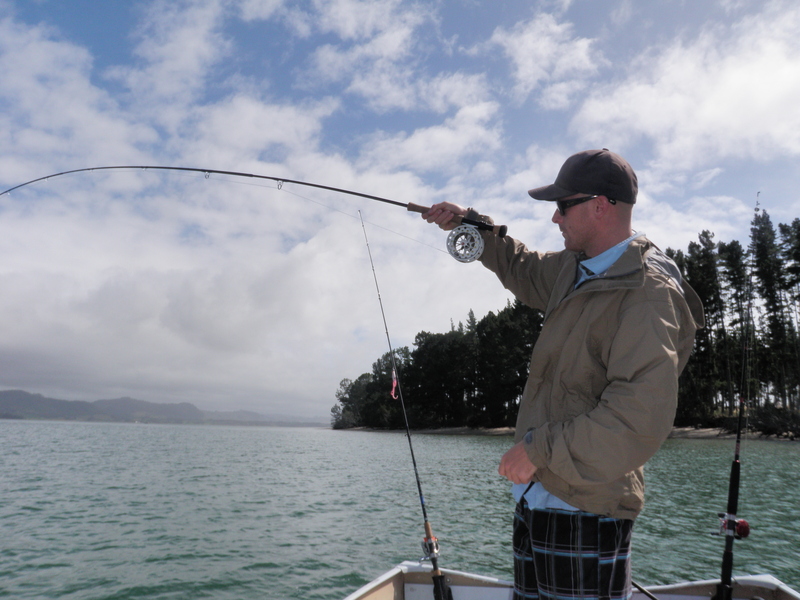 Especially with all the current debate raging on the state of the Taupo fishery, but that’s a whole different topic. Sure, I’ve found it a little tougher in the last couple of years but that’s fishing for you. Sometimes you strike it when it’s red hot, at other times you wonder why you bother. 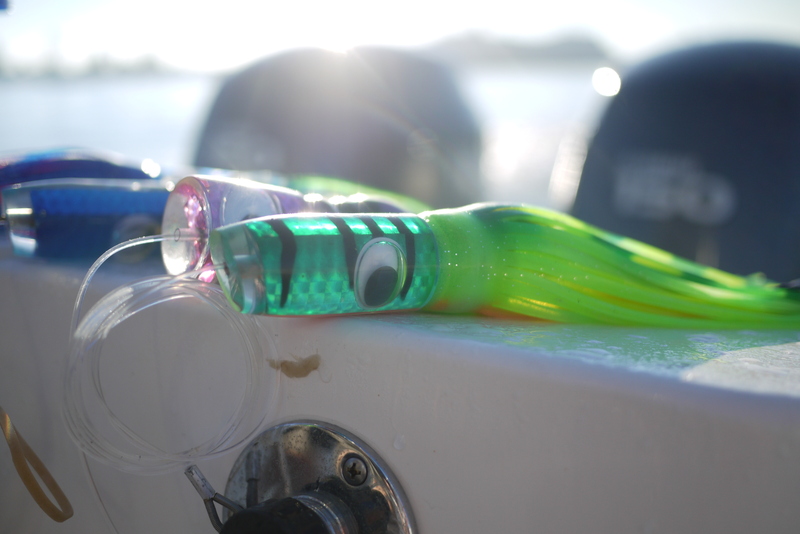 BUT, it will never take away from the fact that a day on the water is just plain good fun. We had also decided the Waitahanui could be worth looking at so made the trip back over the hill. The agreement was to look at Peehi Manini Rd as there had been a good westerly blowing into the mouth over the last few days. 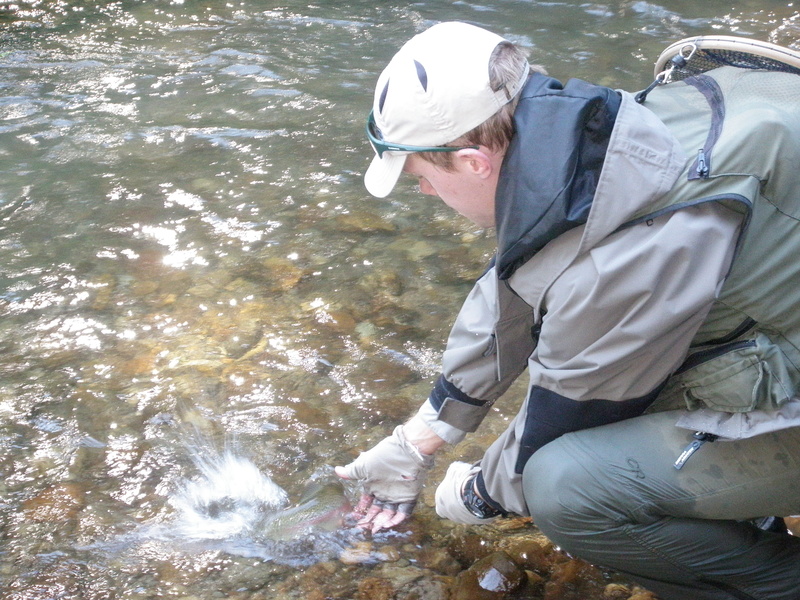 It was only a quick look in and never saw a single Trout despite our best efforts. Maybe they were further up already. Golf was next up for the Old fullas daily activities so we parted ways at the house, I went onto pick up some more 6lb fluorocarbon, look at flytying gear (opps I meant buy) and carry on fishing. My afternoon was going to be full as there were a few spots to hit. The Tongariro had a recreational release so I curiously peered over the road bridge to see if the infamous bridge pool was hotting up with the increase in volume. 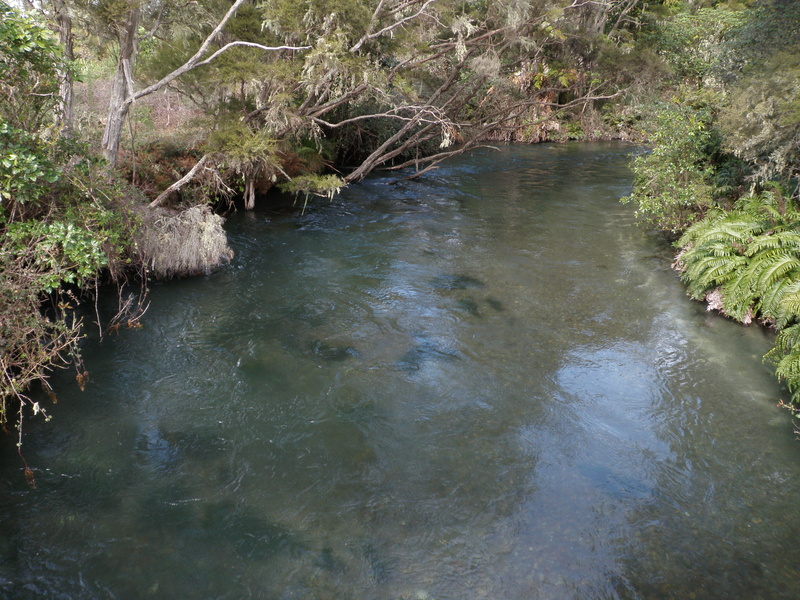 It was now dropping and had a good colour with pumice and debris flowing quickly downstream, nothing happening here. I gave the surrounding area a few of my flies and threw the towel in. I bet it was damn good 1st thing Sunday morning once the fish had made their way up. 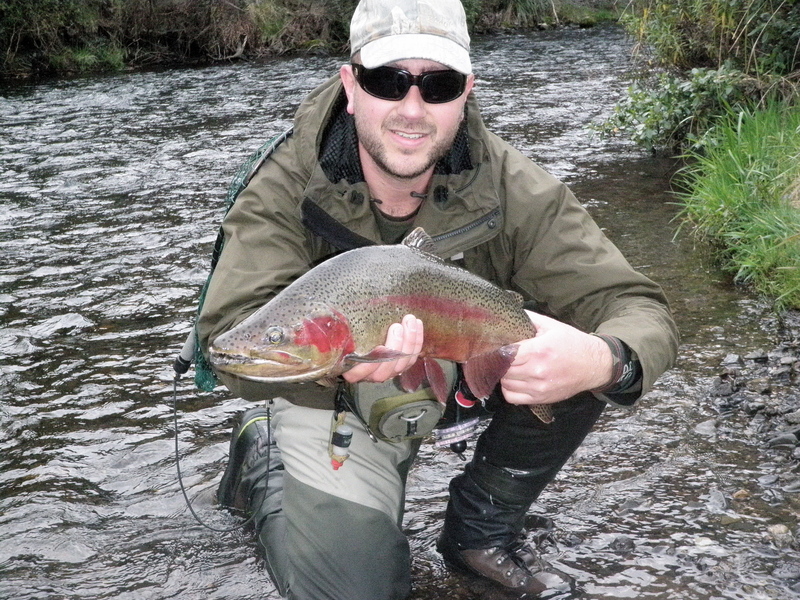 Next up was a river that a fishing buddy had sworn me to secrecy over, so it won’t be named. It is however between the last two rivers mentioned and not really super secret. He’d just done well on it 1st thing Friday morning. When I got to it there had been a few anglers hammering it so the fish were very spooky. 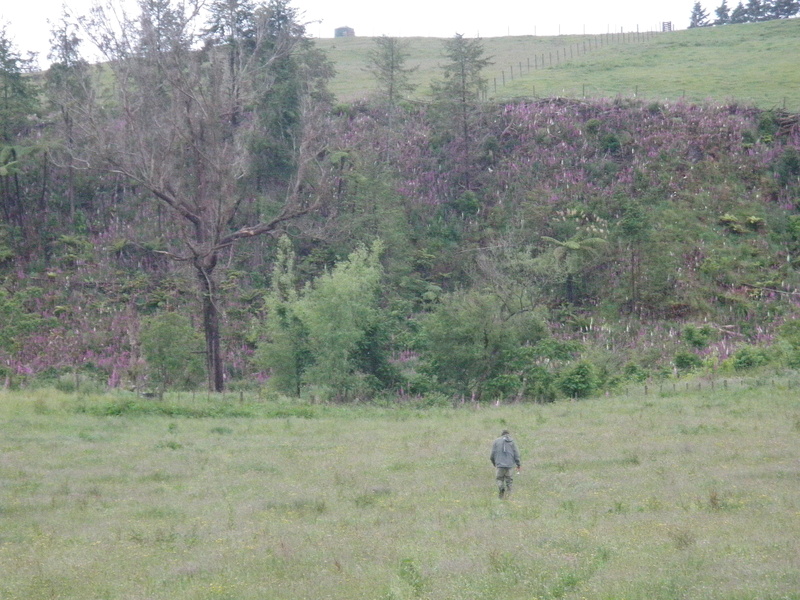 The bush and snags were good for practice though and not a single fly went awol in my time there. With the sun getting lower in the sky I high tailed it back to the Waitahanui rip with hopes of a freshie for the smoker. I had my doubts about the westerly still blowing yet there were 3 guys out already. I got in line and proceeded to get slapped about by the waves. The sunsets are always nice there and you’re often distracted by a yank on the line, this time nothing came out and one by one we all went home. The cop at the booze stop told me some guys passed through earlier with a boat that had done well. Harling has started to produce mixed bags and is a good option for some bigger specimens in the coming months. The following morning I did the Hinemaiaia solo. Dad had recently opened up his finger quite badly so sat this one out. After a casual wake up and change of boot laces I made it to the same beat from earlier. I worked through each section and leapfrogged other anglers on the way up finally spotting a good looking fish in the shallows. It was happy to watch a few changes of fly drift by until it snapped out and fell for the old globug routine. See ya, I watched its powerful tail flick down the rapids as I ran back down around the submerged tree I had just passed. Thankfully one of the other anglers was around to net it and did a good job pulling it out. On his scales it just hit 5.5lbs and was in full spawning stripes, it’s still out there if anyone wants it. 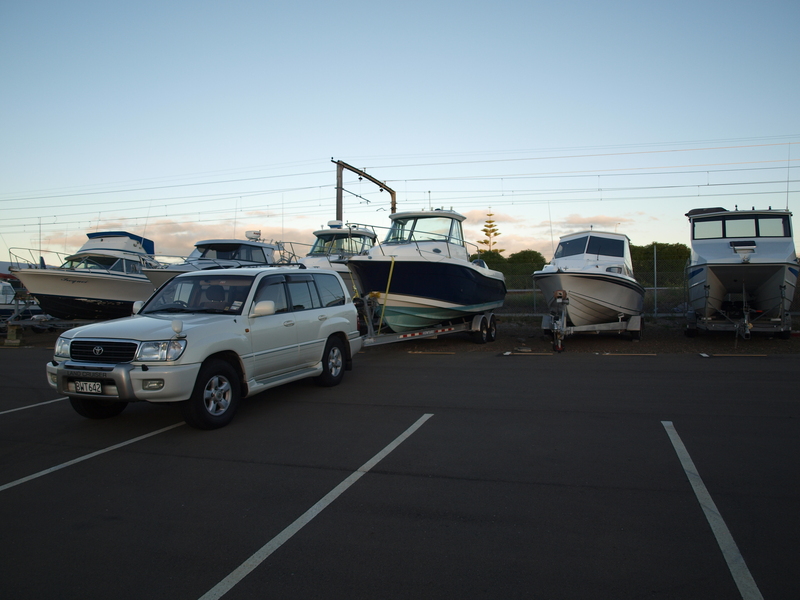 Thanks to the guy from Pukawa Bay for your help, sorry I never got your name! My last port of call was the Ngongotaha on the way home. As I got there the skies opened and I got pissed on solidly for an hour. I hadn’t fished the section just above the town bridge so went for a look. I could only make out one good fish sitting in a tricky spot but slid down the slippery bank as I lined up a bow and arrow cast, nearly putting the fly in my finger instead. It soon had me figured out and cruised off to find a log to hide under. Eventually I found form and struck into a flighty little Rainbow that came to the bank in short order. One more fish from under the noses of the local boys on the way back down had them laughing when I put it back, not quite meal worthy. All up it was a good trip with loads of pre season conditioning thrown in. Bring on October 1, I will be match fit. Alex and I are going to have a few days fishing so should have a report for you all. 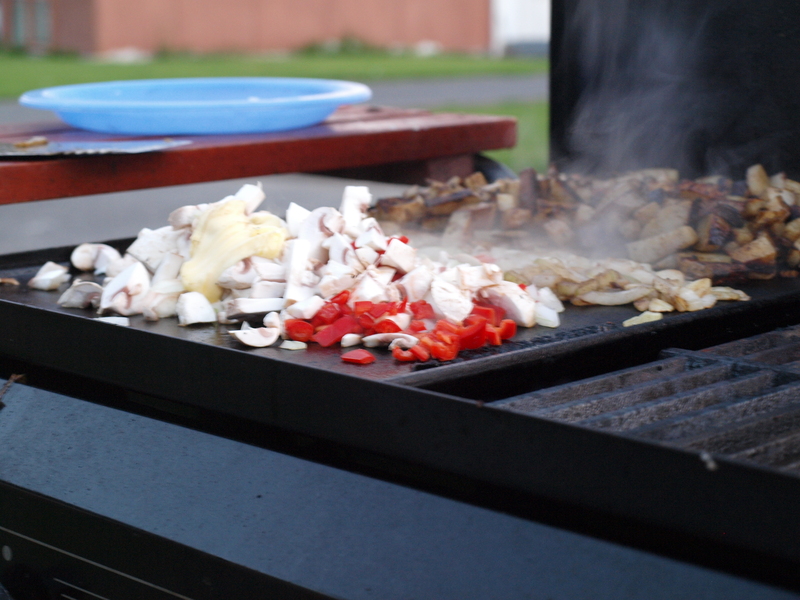 Stay tuned, the whole team will be out and about so expect a busy wee blog in the next while. 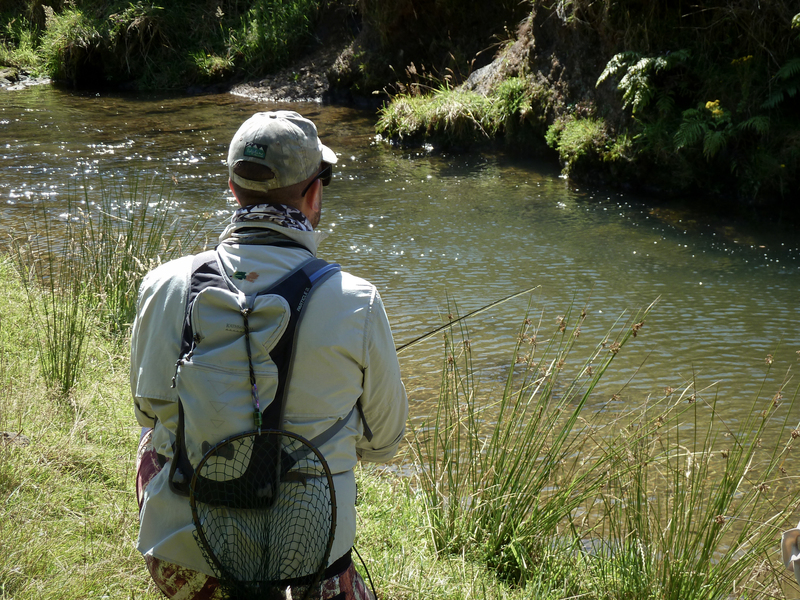 Don’t forget to subscribe to the blog and tell your friends to get in the draw to win some spanky new XRT waders.